MMS, OZONATED WATER, H2O2, DE, GROUNDING ETC. Let me start straight away with something that is underrated topic among many travellers. One thing that many people seem to ignore is that when travelling in tropical or otherwise in so called developing countries in addition to minor injuries, diarrhea and common colds, over the course of extensive travels we will be exposed to risk of parasitic infections. Actually the same is true even at home where ever we live, east or west, north or south, but the understanding of regular “deworming” as basic procedure for humans, as we do for out pets, has vanished in the west or it has been downplayed as a result of increased hygienic standards that still do not make us immune to the bugs. I encountered persistent infections of Ascaris worm and Blastocystis hominis protozoa parasites while in Thailand and after two years I am still fighting with them until just recently, as I think I finally found a solution. When it comes to medical travels it is better to avoid any random eateries and out of ordinary expeditions where you might be exposed to something that hinders your recovery, or gives you more problems on top of the existing ones. That is something what happened to me even though I did not even do more exotic adventure than falling for some ordinary looking food stall at the Chiang Mai night market where plenty of other people were eating as well. In short, adventure travels and medical travels should be kept separate. No place is safe from parasites. Beware even at populated eateries if the food is not properly cooked. I got my bugs somewhere there at Chiang Mai night market. The parasitic infections made me discover bioresonance scanning techniques which I have reviewed elsewhere on this site and also dig deep into the medications and pathogens life cycles that fall into allopathic category and long fight with insurance company in order to get properly tested of everything I might have been infected with. Speaking of allopathic modalities, first thing you will be given after roundworm diagnosis, such as Ascaris infection, which is one of the most common one, is albendazole. Based on my research and personal experience it needs to be taken much longer than the official dosage recommendation states, which is usually 2x400mg, in the morning and evening 12 hours in between the doses over three days time and then repeat after two weeks again. The dose should be taken along with 40 g of fat to help its absorption. There are alternative protocols such as this one found on Curezone. Albendazole might do the trick all the way if taken long enough, but I could not take it more than five days in row. It made me so tired and weak that I was barely able to function and proceed basic daily activities maybe also due to my underlying sleeping issues. Therefore I could not go through the Curezone protocol. Instead I repeated the course about 6 times in row replacing it one or two times with mebendazole and then later on 2 more times with mebendazole alone. But the problem persisted. At some point I thought the Ascaris was already done, and I was focusing more on Blasto, but the bugger was hiding somewhere in larva or egg form and came back year later. It must have stayed dormant over the months during my experiments with different herbal products and ozone therapy. But on my trip to India again, symptoms started to surface. Maybe I should have taken only albendazole and not mebendazole as the latter one only works inside the intestines while albendazole goes everywhere including nervous system. But I felt that mebendazole was helping more the Blasto symptoms which I did not know I had back then. So I mistakenly concluded it was more effective. Mebendazole can only give temporary relief of Blasto symptoms, but it won’t cure it. Ivermectin, a little newer broad-spectrum systemic drug that is significantly more expensive at least in Asia, but with less side effects than albendazole, can also be found in some places, but not as easily over the counter as albendazole and mebendazole. This blogger has written down more potent protocols how to use it efficiently. Some doctors like in my case may only subscribe one or two doses that are not sufficient. That happened to me in Thailand. And that time I was not familiar on how to use it efficiently for ascaris so I did not bother going to other doctor. Another type of non-systemic drug that is probably even better than those two for clearing the worms out of your intestines is pyrantel pamoate/embonate. In some countries like in Finland it is not sold for human use, but is found only in veterinary medicines for cats and dogs. And of course are expensive and out of medical insurance coverage. Ivermectin that works the same way might be available for human use, but is more expensive. I did not experiment with pyrantel pamoate that much, but took just 2-3 doses in Philippines where I found it cheaply. The advantage of it over benzimidazole class compounds like albendazole and mebendazole is that it won’t kill the worms, but only paralyzes their nervous system. In that way the host is not exposed to massive loads of eggs the worm will pass when it dies. It minimizes the risk of re-infestation. But still if going the allopathic route, one needs something to clear the other areas in our system and then albendazole, mebendazole or ivermectin comes into picture. Or ivermectin/pyrantel + albendazole combo might be good to try and if having tapeworms or flukes, pyrantel + praziquantel. However, consult your doctor if trying out the allopathic options and do your own research too(see legal disclamer pare or scroll down to end of the article). There are warnings of self administered combos especially if your liver is weak. And the combo does not necessarily mean taking them both at the same time, but the other first and the other afterwards. Here is some discussion about it. And another articles about semi-allopathic protocols that are developed by several doctors such as Dr.Klinghardt and researcher Andreas Kalcker(Ph.D) and others. I also ended up eating three weeks nitazoxanide which I bought from India on another trip where one month course costs only about 10 USD. It is among the newer generation of anti-parasitic medicines and in the USA the same amount has been said to cost easily up to 1000 USD. In Finland they ask ridiculous 2600 Euros for such! But for people in US it’s easier to go to Mexico and buy it there, where it is said to cost just about 120 bucks. It is mainly for amoebic infections and surely killed something, but not Blasto and Ascaris. Some people claim they have cured Blasto in 30 days with it though. But I missed the last week so I can’t say whether it would have been sufficient or not. I don’t know the price in Thailand, but it surely is closer to Indian one than European and American. Antiparasitic herbs that may help. I did not manage to eradicate Blastocystis hominis with them though. After few months of those travels, where I got the parasites from, and experiments on different herbs I had noticed my urine getting foamy at some point as if my kidney had some problems and I could not find reason for it. 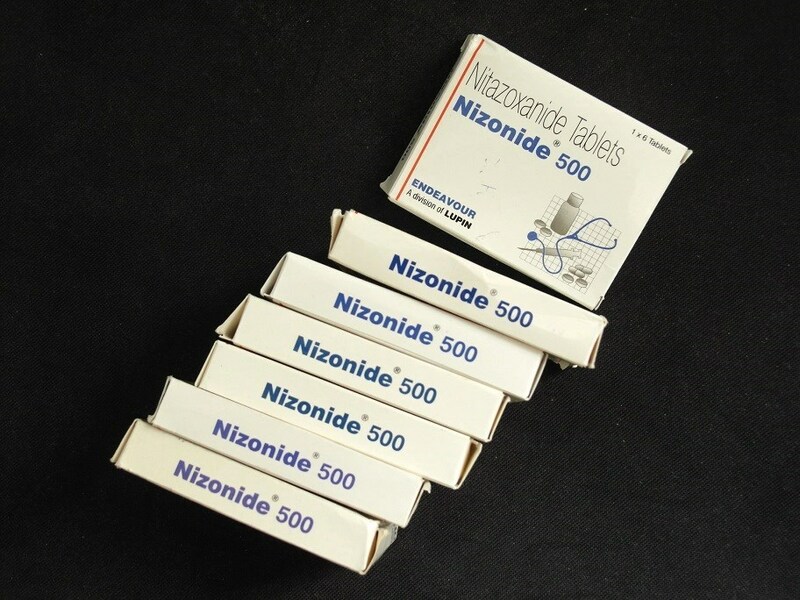 It lasted for many months, but soon after only about two days on nitazoxanide the problem disappeared. Maybe some parasites had made their way to that area and caused the kidney problem. I don’t know. It’s a mystery to this day as all lab tests were clear all the time. However, going through almost every available treatment out there, such as herbs, diatomaceus earth, MMS(Chlorine dioxide), ozone therapy, and hydrogen peroxide by drinking, I finally found Rife system called Spooky2 that made the trick for Ascaris at least. Blastocystis hominis is still there when writing this. Spooky2 is philanthropic experimental project that offer cheap frequency therapy system, also called as Rife machine, for every home with plenty of expandability and room for customization through it’s user interface program. But it has relatively steep learning curve and one must have some nerdy edge to play with it. It can help for eradicating parasites, viruses and bacteria and removing toxins such as heavy metals and to heal many other conditions and pains. Here I can share the settings I used to get rid of Ascaris lumbricoides finally after battling with it about one and half year. (UPDATE: It used to start on philanthropic basis before the original support forum that was founded by David Bourke, a core team member, was hijacked by the Chinese sales office on 9.11.2017. That changed the course and spirit around the whole project.) David Bourke has another forum called Spooky2ICU and his new team is soon launching another Rife system from Czech manufacturer. The plasma unit GenEsys is already out. Spooky2 screen shot of Ascaris lumbricoides killing settings. Click to see it bigger. You’ll find so called Newport(user from Curezone forum) frequencies that are in the database(Ascaris lumbricoides all stages) and then select H-Squre bomb, 11th harmonics, -100/+100 offsets and max voltage, 50% duty cycle, inverse sync and boost cable and 0.2 feathering with so called BN remote 1.1. Pretty basic settings, and it worked without any other tricks. I even felt how my lymph nodes were hurting after few days of running the program. I did not use it overnight because it disturbs my sleep, but like 8-11 hours a day. For more information I suggest you to register into the user forum. Keep running that everyday for a month even during nights if you can. I think I did not hold on to it long enough, just few days, because I felt the symptoms started to surface again after one and half months so I had to repeat the “course”. So called DH settings developed by David Halliday, a user from the forum, are worth trying too if these ones won’t do. 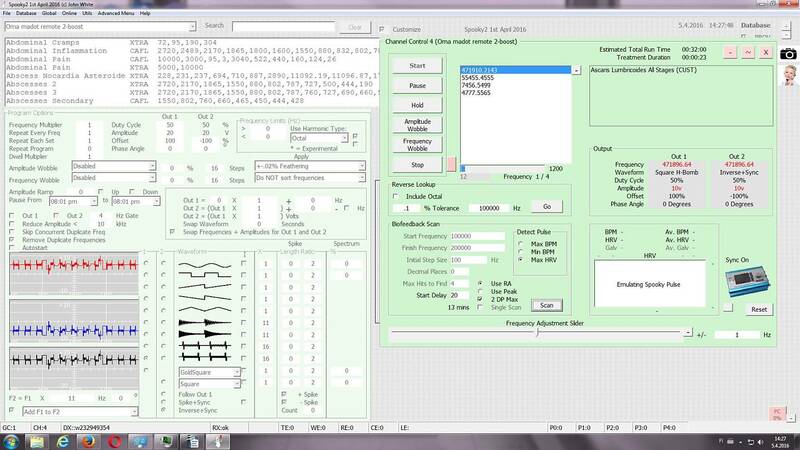 You can try “Frequencies directly” option with his settings too, without feathering. Another type of frequencies and settings that can be used with Spooky2 are based on Charlene Boehm’s DNA frequency research. Those frequencies are calculated from the DNA length of the pathogen by her patented method, instead of targeting the MOR of the pathogen itself. You have to pay 15 USD for the ascaris set though. There are ready made settings in Spooky2 for her frequencies, but alternatively one active user, Walt Dod has developed his own settings to be used with her frequencies. Also for Blasto she has DNA frequencies. After trying them out I am not sure about their effectiveness at least concerning Ascaris. One reason for dim results can be that the set of frequencies were calculated from Ascaris suum DNA, which is found in pigs and might have little different DNA than Ascaris lumbricoides found in humans. Her opinion was that they are both considered as same species like some research suggest, but still, it won’t change the obvious fact there can be some minor difference in DNA that affects this type of delicate modality when calculating their resonance frequencies and then lowering them into subharmonics that suit most frequency generators. Crucial information can be lost on the way. I am not yet to conclude how the Blasto frequencies will do as I may need to try out contact treatment in addition to remote ones. Or I will do the so called Pulse scanning that may find more accurate frequency. The Spooky Pulse is an additional tool for the system that makes it possible to scan any problematic frequencies using modified pulse rate meter. You can read about the different modalities on Spooky2 website and forums. Here are some non-allopathic tips for buying stuff on the way and what to carry from home. Mostly these are from Chiang Mai, that is the hub for health conscious travelers in Thailand, and from Goa, India, but I will add places and items as soon as this website evolves. And there are links for buying some of them before taking off. There used to be dealer in Chiang Mai for food grade Diatomaceus earth, but their website is down, e-mails won’t go through and I could not locate a new address one. So I assume they have ceased operation. 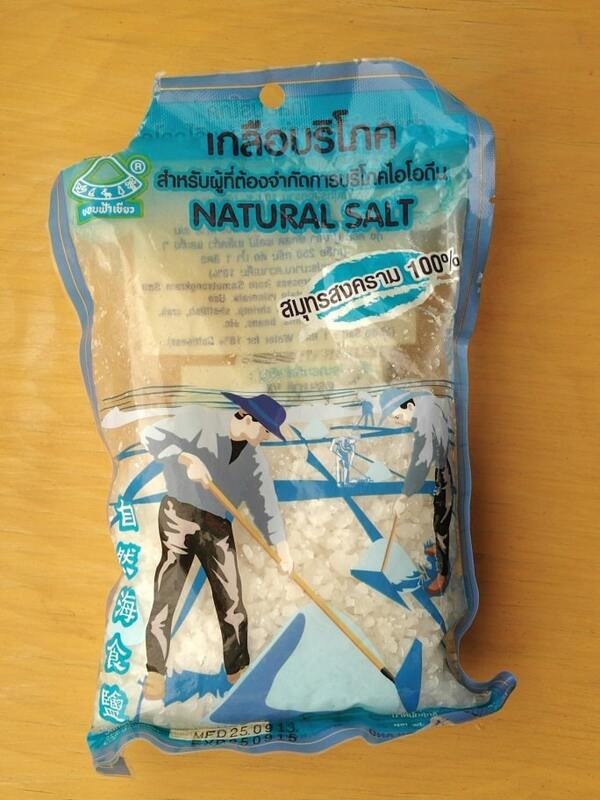 But if you can not find DE from several health food stores around the city, there is another Thai company(tkdiatomite.com) in Lampang that sells it. Their website is down so you may try it later. Also Biovea online shop for Thai customers is one option. Some people find it has positive effect on intestinal parasites. But personally I am not sure how effective it was. Maybe it did something, maybe not, but as we know Ascaris’ like some other parasites larvae, is usually hiding somewhere out of the intestines, in other body cavities or lymphs etc. so the effect of DE is limited at best to those bugs that are only present in intestines. And it unlikely kill protozoans either, because it’s effectiveness is said to be contributed to it’s grainy and sharp tiny particles that physically destroy the parasite and it’s negative ionic charge, not that it would be somehow toxic to them as many herbal and allopathic cures are. What ever the case it is surely at least great source of silica and many other essential trace minerals. In case you need DE before travels or to be used at home this product is a good bet. Coconut oil – good for oil pulling. Coconut oil is good to have for doing oil pulling that help keep oral health in check. It has also other properties as biofilm breaker in gut and blood sugar stabilizer if used internally. 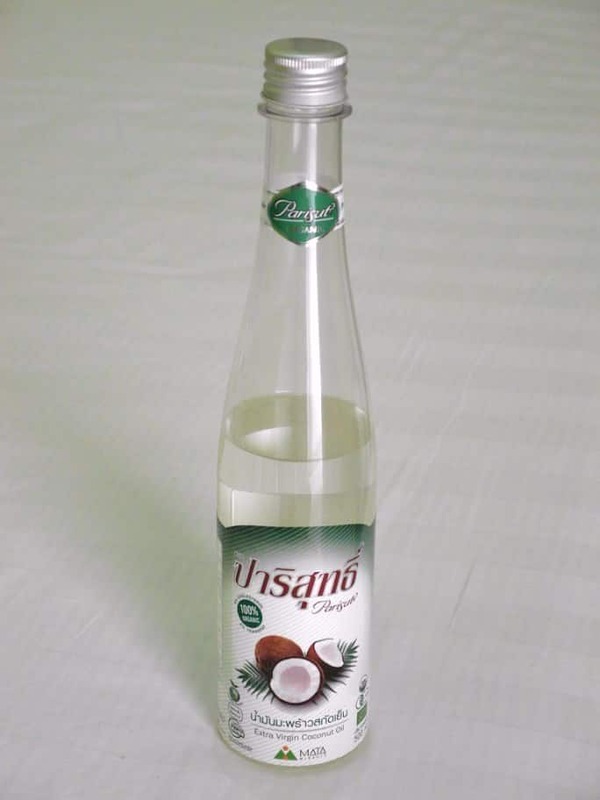 There are few brands available in Thailand and even more in India and some of them come even in glass bottle, but for traveller plastic is more practical being more lightweight and durable. 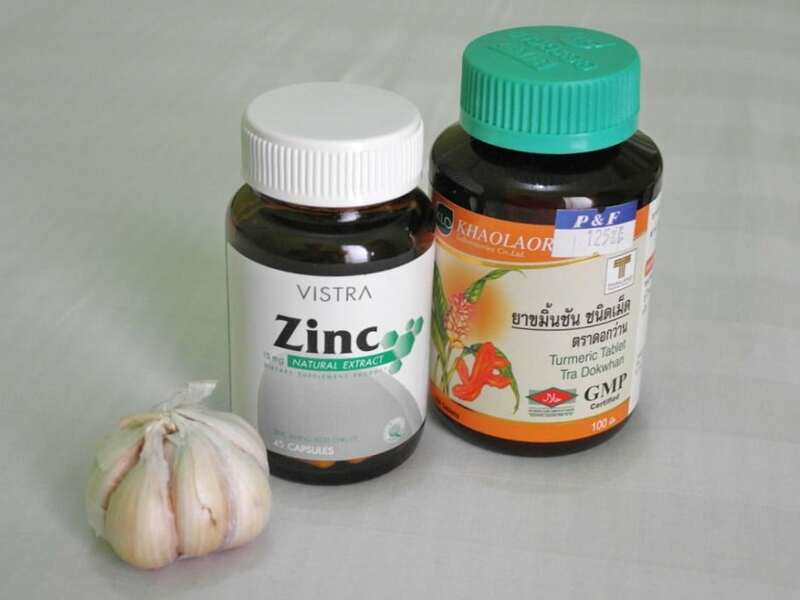 Some basic supplements for GI problems and immunity support that you can find in any shopping mall or pharmacy in Thailand include garlic, zinc and turmeric. In any case those supplements taken with Glutamine amino acid will help your gut to stay in condition. Fresh garlic should be taken to empty stomach few times a day, at least 2-4 cloves at a time depending on their size. That regardless of whether you are able to go through two weeks round on albendazole or not. Garlic is also good first aid before you get your hands on something else. And if your guest house or favorite restaurant can make you drinks with papaya and pumpking seeds and garlic mixed with papaya fruit two times a day, you are on the safe side, at least temporarily:-) And it won’t hurt to have those as preventive measure once in a while. Those are surely available in many other countries as well. In India, in Anjuna village there are two super markets that sell health products, Oxford arcade and Orchard supermarket. Read more about it on Food and Shelter in Goa article. MMS Protocol 1000 mixed in old gin bottle. 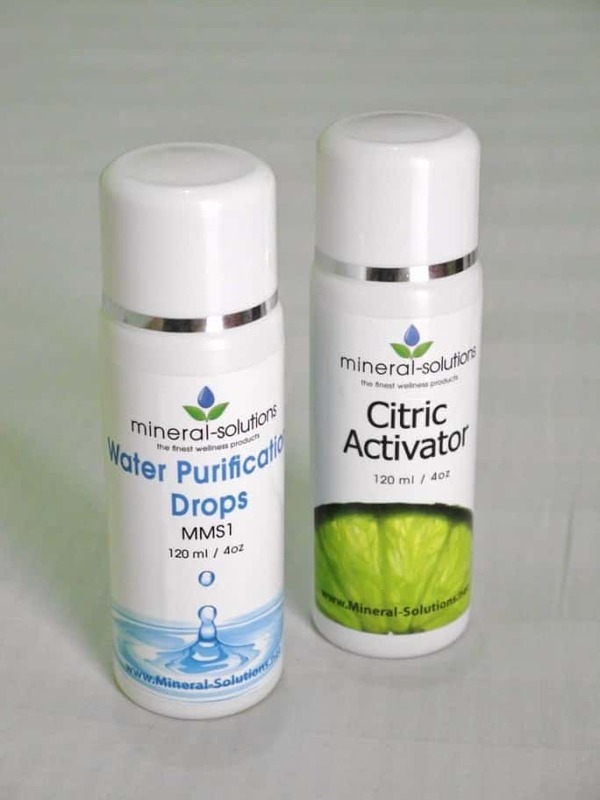 MMS(Master mineral solution) set – aka chlorine dioxide. 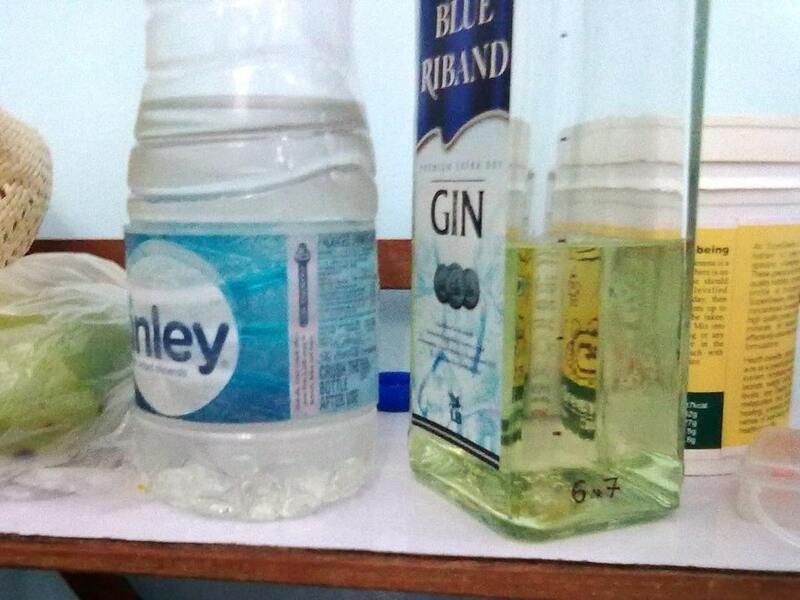 On the upper right corner there are mixed MMS(Chlorine dioxide) in a used gin bottle in Goa. It’s made of Indian Nutri Alchemist MMS products sold in Goa. 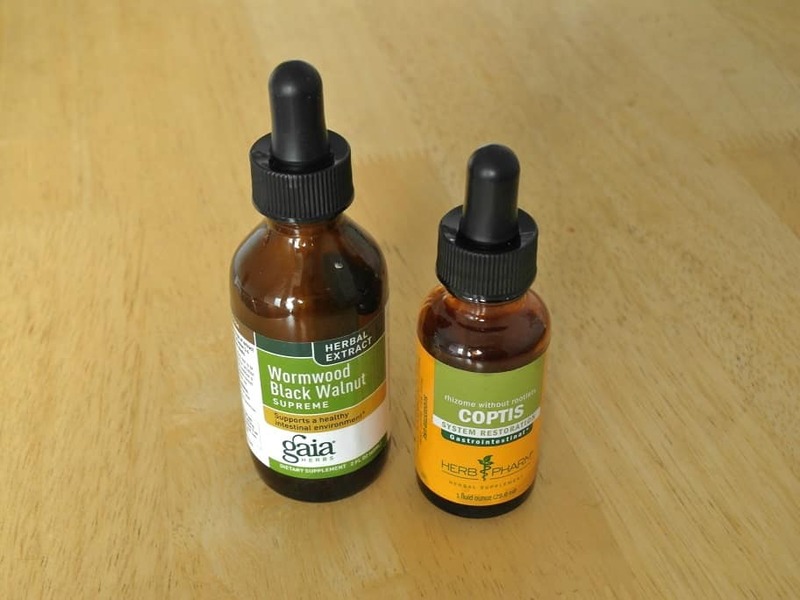 Taking 2-3 drops every hour for 6-8 times a day is said to be more efficient than 2-3 stronger doses. But it depends. As a reminder for those who don’t know yet and if you scrolled through the beginning of this article, MMS may help with parasite and many other topical or systemic bacterial infections. On down left corner there are bottles of MMS from SANUS-q, a natural health products company that can deliver world wide. They used to be called Mineral Solutions, but recently the company was re-branded(update 2017). And as a latest update (March 2018) they have now stopped selling MMS all together due to legal restrictions taking place in UK. However, if you happen to be in Thailand and still like to buy some other products such as liposomal vitamins and Q-10, there might be express delivery available, but check with the company the current status and means of delivery. Back to my story, unfortunately my first impression of their MMS was on the negative side as the set I got was defected, and did not work at all, but after letting them know they sent me bottles from another patch and they were of prime quality. It took some time for the first delivery to reach Luang Prabang where I was at that time, and the second package I had to receive in Udon Thani where I was heading from Laos. So the second delivery was fast. I think it didn’t take more than two days to receive it and I was compensated by three big Jiaogulan Chinese green tea packs. So I am happy to recommend them, especially if you are travelling somewhere in SE-Asia. There are, or used to be, some health stores in Thailand that sold their MMS locally, at least in Koh Samui island. But I don’t know how they will get new stock as SANUS-Q has stopped delivering them. On the right bottom corner there is water ozonation going on. Benefits of drinking ozonated water covers many not so serious GI issues traveller may come across. And it’s much more pleasant to ingest than MMS. I had the cheapest of the cheapest model with me that actually broke soon after that photo was taken. Very short lifespan is a common problem with the cheapest models of water ozonators. Therefore I suggest buying a better one like Enaly OZX-300AT or this one. UPDATE June 2018; Now the recommended place to buy MMS/AMS online where ever you are is from Activated Mineral Solutions that operates from Spain. It’s most convenient for European clients and I don’t know their delivery times to SE-Asia. These travel kit bottles come with good droppers so that the dosing is easy. One way for helping our bodies to cope with EMF’s that are nowadays almost everywhere due to rapidly expanding Wi-Fi and mobile phone networks is earthing or grounding, what ever you call it. Grounding means simply electrical connection to earth that has positive impact on our health as it takes the load of harmful electronic charge out of our system. I would recommend to carry a grounding mat if you are sensitive to electromagnetic fields. It can be placed under your arms while sitting at computer and under your legs while sleeping. 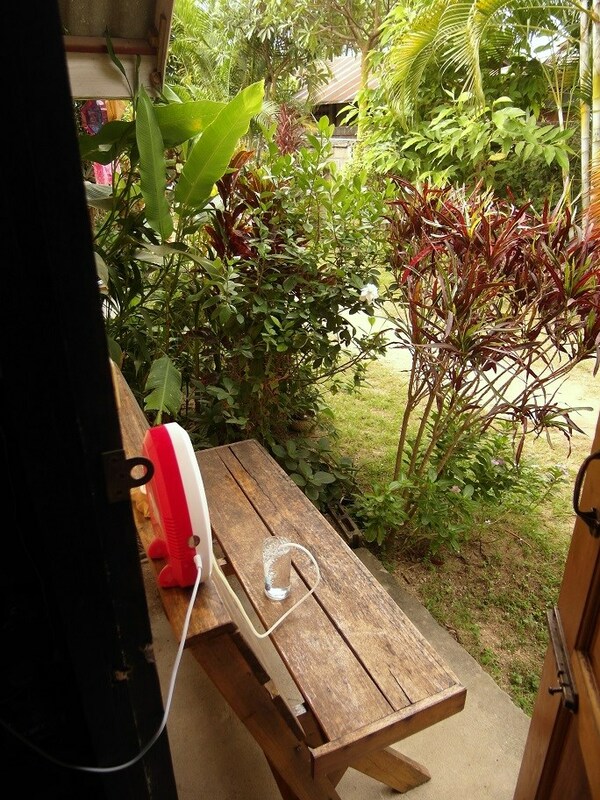 Especially when travelling it is easy to use the rod option for connecting the mat to earth instead of sockets. There is controversy whether the grounding through house wiring is beneficial or if it’s even harmful. To be on the safe side the direct rod connection is preferable. First nights might feel like getting reverse effect and sleep is disturbed, but soon your body will adjust. Grounding mat is easy to carry with or use at home. Being occasionally grounded helps our system in many ways. I bought mine from Groundology. For US readers buying directly from Earthing main supplier might be better option. There are some products on Ebay if you want to try to collect similar set from different suppliers and save few bucks. But you must make sure the connectors are fitting and interchangeable. This video below will show grounding mat being attached through window into the ground and how the water ozonator works in guest house environment. As you see it’s better to keep it outside so as to make sure you don’t breath the ozone gas. Our lungs is the organ with lowest resistance to strong oxidizer such as ozone, while most other organs and cells have natural resistance and ability to create antioxidant response and other reactions that improve our immunity system as long as the limits are not exceeded. This may come like stating the obvious and what I have probably mentioned elsewhere, but what is one of the most important things to have in hand in hot environments especially if you have symptoms of CFS is a pack of sea salt that you can mix into your drinking water. Even some doctors recommend salt water and low-dose naltrexone(LDN) for CFS patients. LDN is allopathic substance though. And another thing I recommend is mixing some hydrogen peroxide(3%) into a spray bottle that you can use either inhaling by spraying it into your throat in case of acute illness like Bill Munro does in his famous video where he testifies even curing his prostate cancer by such method, or just disinfect what ever you come across such as your hands or fruits you need to peel by bare hands etc. You can also mix few drops of sea salt into the mix. It makes the solution less irritating to mucosa. 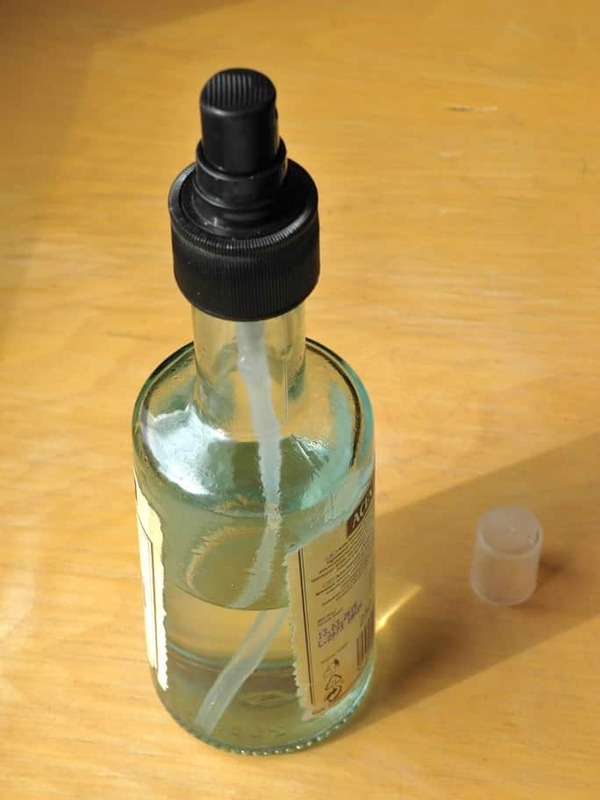 I use vinegar spray bottle which I had bought from Lidl grocery store back home. Of course it must be thoroughly washed after the vinegar before H202. If having 12% or 6% food grade available that you can buy here, you must dilute it with sterile water to get the right strength. 2-3% is good for spray. Enema bag – a basic tool for detoxing and colon cleansing. Regular exercise is important where ever you are for maintaining physical fitness and it furthers healing if done moderately. But I know that especially CFS patient may have hard time even to survive the normal daily activities and the treatment protocol can make one more tired in the first weeks before any noticeable improvement. But depending on how serious your condition is most basic exercises one can do in the guest house room without going to look for a gym or swimming pool or beach. Here are few pictures of how to use the ordinary 5L water bottle as kettlebell or as just a weight for doing some simple pull-ups to keep shoulders flexible. Multifunctional 5L water bottle – easy exercise for arms, shoulders and upper back muscles. As insomniacs who have done even little research know that primary and secondary insomnia both have different causes that general practitioners usually fail to recognize or use sufficient resources and effort to properly diagnose the root cause. Sleep studies are reserved mostly for sleep apnea cases and hormone panels, amino acid and mineral balance tests are not covered by most insurance plans. What I came to realize that if insomnia is caused by adrenal fatigue that is consequence of mercury redistribution can not be fixed by sleep meds. The HPA axis won’t change it’s course of function as along as the stressor is present. We must clean our cells from the toxic invaders before the healing may take place, or before any medicine or natural remedy would reach it’s full potential correcting the brain chemistry. At the moment I am on Cutler’s mercury detox protocol to heal my remaining sleeping issue that made me to wake up too early that was obviously caused by “dump phase” or redistribution of mercury that is normal side effect of that protocol, but as I had not read the Cutler’s book before experimenting, I did not know it was caused by too high doses of alpha lipoic acid like I told in My Journey chapter. It seem to work fine so far and I am hopeful it will be finally the answer to fix the problem completely. During these years I had to try plenty of supplements and herb and tricks and even some sleep meds like mirtazapine to fix my sleep and it helped a little to fall a sleep, but of course did not fix the underlying issue that was obviously the mercury toxicity. So I felt like I wasted lots of time and money, but that made me to study and gather all this information I am sharing with you here on this website. It’s comforting to think everything has some kind of purpose. -Before going to bed take table spoon of organic coconut oil and butter. Or try MCT oil but in lesser amount, like one tea spoon. With both adding half or full table spoon of honey. -You may add table spoon of gelatin mixed with water along with the above mentioned fats and honey. Gelatin has plenty of amino acid glysine in it that is inhibitory, therefore helping to relax and lowering cortisol. In addition to possible sleep aid it’s important source of other amino acids that our diet nowadays often lacks and are needed for joint, skin and bone health. Also Lysine and Arginine are said to have cortisol lowering effect. Or a combo of supplements such as glutamine, glycine, GABA and taurine. 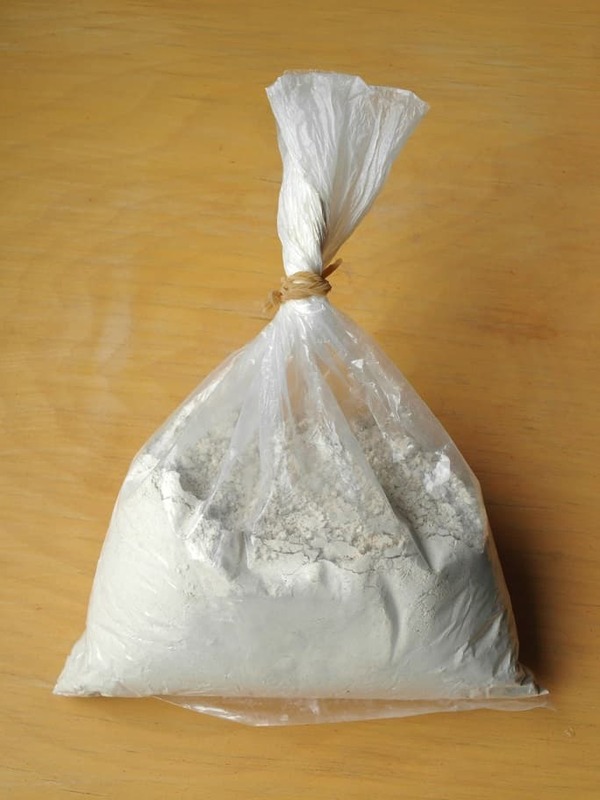 Glutamine in the highest amount, like one level tea spoon and the rest just half of it. -Do Qi Gong stretching before bed or at least the very simple version of it that goes from around 3.00 till 6.40 in the video. -Zinc supplement of 25mg might be good one too. Saving the dose to be used as sleep aid might be better than taking it in the morning with other possible supplements. I find this one being optimal considering price, quality and quantity and dosage. 50Mg is probably too much. –Grounding mat under your legs or preferably complete grounding sheet, pillow and blanket releases excess electromagnetic charge we all have in our bodies and consequently aid sleep. I have used only the mat and mouse pad. -And of course ear plugs and sleep mask, that will go without saying, will be necessary if you are sensitive to noises and light and especially if you live far up north where summer nights won’t be very dark. -One trick I tried for some time was so called Brain Wave Vibration method, but I stopped it after about month and half as it did not give very good results considering the effort it required. But those without mercury issues it might do better. It is all basically about standing or sitting and shaking your head around for few minutes at a time at least two times a day. The inventor and his association have got some questionable reputation, but the head shaking does not cost anything. Worth a try. -Other herbs that might help include California Poppy, herbal mixtures that include multiple calming herbs like this one from Amazon Therapeutics, GABA, tryptophan, 5HTP under tongue, and Seriphos. Seriphos, like phosphatidylserine, works lowering elevated cortisol which is one factor in sleep issues. Affiliate disclosure: There are affiliate links in this article. Please note that when you click links and purchase items, in most (not all) cases I will receive a referral commission for maintaining this website. Legal disclaimer: Information provided is for informational purposes only and is not a substitute for professional medical advice. No health claims for these products have been evaluated by the United States Food and Drug Administration (FDA), nor has the FDA nor any other medical authority approved these products to diagnose, cure, or prevent disease. Since every person is unique, we highly recommend you to consult with your licensed health care practitioner about the use of ozone products in your particular situation before using ozone therapies on yourself. Neither medicaltravelling.com, it’s authors nor the manufacturers of these items are responsible for misuse of these equipments, modalities and substances.